It’s one of the policy areas that is being vigourously debated at the moment by both parties but as anyone who has a basic understanding of statistics will tell you, statistical data can be made to dance any merry old dance, depending on who is calling the tune. 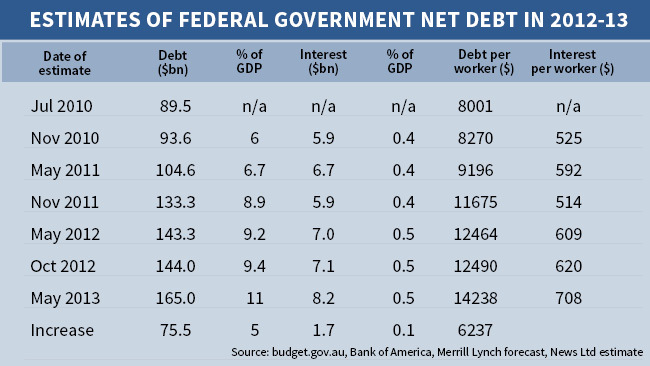 What the ALP would have you believe is that, comparatively speaking, Australia’s current net government debt is very minimal. But this is only when we are compared with some of the world’s most toxic levels of government debt. A recent Facebook post from the ALP’s page would have you believe that our debt is minuscule in comparison to everyone else and everything’s going to be alright, Jack. This is from the party that told us that by 2013 the budget would be in the black by the tune of $1.5 billion. Julia Gillard promised when she went to Rooty Hill in 2010 that failure was not an option and that they would not fail. Unfortunately, Wayne Swan’s ability to balance the budget is non-existent and that iron clad promise has now been scrapped. So the budget’s not going to be in the black by $1.5 billion in a few short months. So where does that leave us? Analysis by Bank of America Merrill Lynch shows that Australia’s 2012-13 net debt estimate rose from $54 billion to $144 billion. But having thrown the promise of a balanced budget out the window, the Bank of America Merrill Lynch forecasts that Treasury would raise that estimate by $21 billion in the May Budget, taking the net debt level to $165 billion. “So what!” I hear you say. Well it means a lot to be honest. If these figures are correct then Government debt levels will have blown out by 80 per cent from what they estimated in 2010. That is an increase of $6,237 for every worker since 2010 and represents a staggering $14,238 worth of debt for every working Australian. If you want to understand exactly how much debt we have and just how fast we have rung this debt up, check out this post entitled Swans Excessive Debt Curve from another respected economist Sinclair Davidson who, unfortunately for the Government, can see straight through the statistical manipulation of Wayne Swan and calls a spade a spade. The chart below of quarterly data from the Government’s own website on Gross Outstanding Debt of the Commonwealth (central) Government tells the sorry tale that faces Australia. As NWA said way back in the day – Don’t believe the hype!